Seventeen, fashion-obsessed, and gay, Abby Ives has always been content playing the sidekick in other people’s lives. While her friends and sister have plunged headfirst into the world of dating and romances, Abby has stayed focused on her plus-size style blog and her dreams of taking the fashion industry by storm. When she lands a prized internship at her favorite local boutique, she’s thrilled to take her first step into her dream career. She doesn’t expect to fall for her fellow intern, Jordi Perez. Abby knows it’s a big no-no to fall for a colleague. She also knows that Jordi documents her whole life in photographs, while Abby would prefer to stay behind the scenes. Then again, nothing is going as expected this summer. She’s competing against the girl she’s kissing to win a paid job at the boutique. 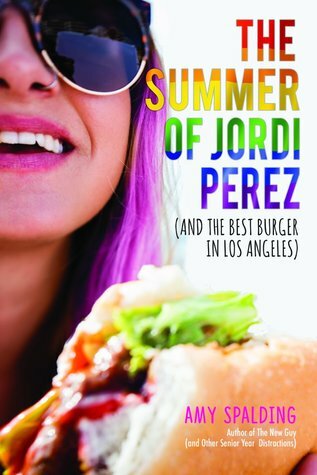 She’s somehow managed to befriend Jax, a lacrosse-playing bro type who needs help in a project that involves eating burgers across L.A.’s eastside. Suddenly, she doesn’t feel like a sidekick. Is it possible Abby’s finally in her own story? This is definitely a feel-good book. While there is serious conflict towards the end, it remains a story full of good humour, positive romance and blossoming friendships. Side bar: I recommend only reading the first two paragraphs of the official blurb seeing that the third contains spoilers. I’m shocked this was overlooked. Abby is a funny, fat and pink-haired gay girl who loves fashion so much she landed an internship at her favourite store. She has never been with a girl before so she has trouble believing that she could find love this summer, especially since she considers herself to be the ‘‘sidekick’’ of her own story, instead of the ‘‘heroine’’. But as she begins to fall for Jordi, the other intern who is passionate of photography, she realizes she might need to trust herself more. Nothing is rushed. Everything happens very naturally. The romance is sweet and gradual. There is no insta-love or insta-lust or insta-anything. It’s not by looking at Jordi that Abby suddenly becomes interested; it’s by talking to each other about their respective passions, lives and selves that Abby’s crush on Jordi grows bigger and bigger until she knows she has to act or will regret it forever. It’s a simple enough story; nothing will blow your mind or persuade you to look at the world differently, but just like Simon vs. the Homo Sapiens Agenda, it will charm you to no end and make you wish you could be part of Abby’s world.